Many years ago I had a mild allergy that led me to bouts of sneezing, watery eyes, et al. After ruling out sinusitis and various other allergies, it seemed that I was "allergic" to stress and fatigue. Actually, the body's immunity falls drastically in conditions of stress and exhaustion, hence one is susceptible to allergic reactions. As a result, every time I was preparing for any exams in school or college my allergy would come up. And if I prepared for my exams over a couple of months the symptoms would remain over that many months. But I realised this correlation between stress and sneezing only much later. When I started working for a magazine, whenever the pages were being readied to be sent for printing my sneezing would return. A regular anti-allergy pill usually settled the condition. Over the years, as I practiced yoga consistently and moved to freelancing (that reduced the stress of sending a magazine to press) I thought I had outgrown this condition. In the last few weeks however my day-long bouts of sneezing started again. Only now, I am wary of popping pills. I do like to experience the magic of yoga and our ancient techniques that actually help the body to cure itself rather than merely suppressing the symptoms by having a medicine. I had, of course, heard of Jal Neti, but had never tried it (not even during my teacher's training course at the Sivananda Dhanwantari Ashram, Kerala). Like most people I just didn't like the idea of taking in water through one nostril and expelling it from the other, and alternating this procedure. I used to call these techniques "abusive", justifying the label by saying that it was "unnatural" to treat a body this way. But in reality these practices are a far more natural alternative to healing a body than ingesting chemical laden medicines. 1. 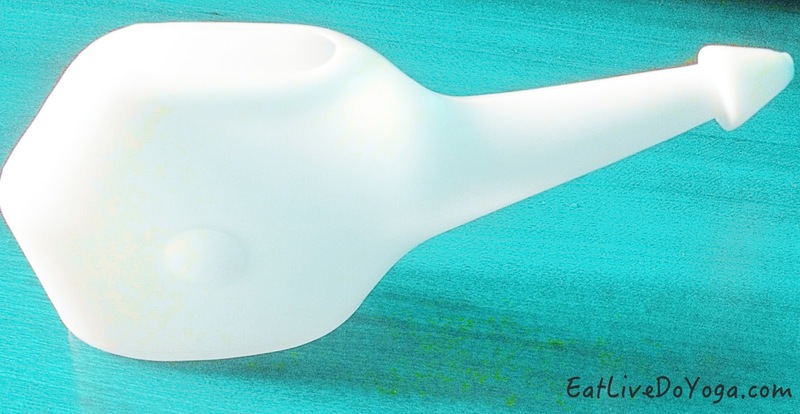 Buy a neti pot. They come in various materials including different types of metals or plastic. Since I wasn't sure how long I would practice jal neti, I avoided the metal one since it was more expensive and bought a plastic pot online. It is light and convenient. I even plan to carry it with me for my forthcoming vacation. 2. Pour lukewarm saline water into the pot. 3. Now tilt your head to one side and slightly back. 4. Insert the nozzle of the pot into the upper nostril; keep your mouth open and continue to breathe through your mouth. Insert the nozzle gently but thoroughly to ensure that water doesn't leak out from the same nostril. 5. The water will naturally flow out of the other nostril. 6. Now repeat with the other nostril. 7. Centre the head and look downward to let the excess water flow out. 8. Gently blow your nose to remove excess mucous. 9. I also like to rinse my mouth once I'm done. The whole process doesn't take more than 2 minutes. I do it right after brushing my teeth in the morning. 1. It clears up the sinuses and removes mucous from the hard to reach areas. 2. Especially beneficial if you stay in a city with a high rate of air pollution. 3. It cools the eyes from within. 4. It helps deal with and prevent various respiratory conditions like asthma, bronchitis, etc. 5. Even if you don't have any breathing problems, you will realise that you're breathing much better. 6. And the most important benefit according to me, and one that inspired me to write this post is that having both the nostrils unobstructed have lots of positive effects on the entire body. In the benefits of this practice, Swami Satyananda Saraswati has explained in the book Asana Pranayama Mudra Bandha: "A balance is brought between the left and right nostrils and the corresponding left and right brain hemispheres." This leads to harmony between the sympathetic and parasympathetic systems of the body which is important to induce a state of balance throughout the body and the systems governing circulation as well as digestion. So, there you go! I hope I have inspired you to give jal neti a shot because of its far reaching benefits on overall health and not merely a technique to clear the nose.